The outer ears designed to collect sound waves, and channel them through a can one inch in length until they reach the ear drum, a thin membrane that vibrates in response. These vibrations pass directly on to the adjacent middle ear, a cavity no more than a third of an inch wide and a sixth of an inch deep, dominated by three small bones hinged together and whimsically named hammer, anvil and stirrup after the ironmongery they appear to resemble. The ossicles, as they are collectively called, are capable of amplifying the movements of the eardrum twenty-two times. 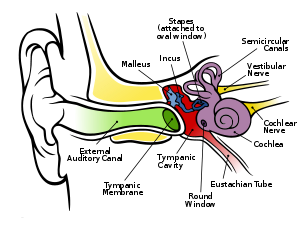 By resounding on the inner ear, the stirrup, the last of the three, passes on the vibrations through the layer of fluid to the main organ of hearing, the snail shaped cochlea. Here the initial sound waves, after finding the nerve cells which respond to their particular vibrations, re transformed into nerve impulses which connect with the auditory centre of the brain to become intelligible sound. The system described above is the chief but not the only avenue by which we hear sound. It is possible to hear by bone conduction, which is easily proved by clicking teeth, munching celery, or more scientifically, by striking the prongs of tuning fork sharply against a hard edge and then, without delay, firmly applying its handle to the bone behind the ear. You will hear a distant sound, which will vary depending upon which bone you bring into contact with the fork. The most resounding result will come when you clench the handle between your teeth with year ears plugged. When we hear an echo, it means that a wall, a mountain or some obstacle is reflecting sound in the way that a flat mirror reflects light. Similarly, just as a concave mirror concentrates rays of light to a single point, it is possible to have a concave sound mirror that will focus sound waves and produce an illusion in the process. Method: Take two identical soup plates, place one in front of you on the table at which you are seated and hold the time-piece inside it, an inch or two from the base. Hold the other plate to one ear. By carefully adjusting the position of all three objects, you will begin to hear the ticking of the timepiece as if it is actually coming from the dish you hold. Close your eyes and you will be unable to tell by ear alone in which hand you are holding the timepiece. Method: standing behind a volunteer, stroke his back firmly with the fingers of one had, at the same time as the other brushes your shirt in perfect synchronization. His brain, led astray by the combination of past perfect synchronization. His brain, led astray by the combination of past experience and false assumption the moment it sees the brush, pieces together the information it receives from the downward pressure put on the back and the sound of the bristles heard through the ears, and reports back to its owner that you are actually brushing him down. This happens because he is already conditioned by seeing the brush,. When he is told that you are brushing his back, the experience already stored in the brain makes him come to the wrong conclusion.